Erez Binyamin in front of the sign at NASAâ€™s Jet Propulsion Center in Pasadena, Calif.
Erez Binyamin is a third-year computer engineering student who was an intern with NASA’s Jet Propulsion Systems over the summer in Pasadena, Calif. 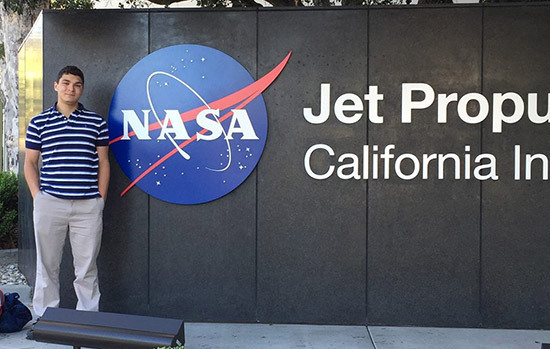 Originally from Albany, N.Y., this opportunity allowed Binyamin to travel across the country to engage with professional engineers and work on NASA’s SWOT (Surface Water Ocean Topography) satellite. He is interested in all facets of computer engineering and was recently hired for a co-op at Parsons Cybersecurity. Binyamin had a unique experience that made him stand out in interviews: He gave a talk about Plato’s Gorgias at Colgate University in April 2017. Speaking at this conference gave him a competitive edge, according to Binyamin, and helped increase his communication and public speaking skills—something that he had struggled with previously. Outside of class, Binyamin enjoys outdoor activities such as surfing, running and sailing. He also works as a peer mentor and a teaching assistant on campus. Q: What prompted you to apply to work on NASA’s SWOT satellite? A: Because NASA is awesome! Basically, I hadn’t done a co-op yet and I had pretty good grades, so I decided to try my luck. There’s an online application and you just submit your résumé to and they get back to you. I applied to a bunch of different NASA positions. I applied to Jet Propulsion Laboratory, I applied to Goddard Space Center, I applied to Ames and others. Ames didn’t get back to me, Goddard didn’t get back to me, Cape Canaveral didn’t get back to me, not even an email from any of them. Not even a “sorry, you didn’t get in.” Jet Propulsion Laboratory did get back to me and asked for an interview, so I, of course, said yes. Q: In your interview for the position, you mentioned that the engineer you spoke to pointed out that your studies of Plato were “peculiar.” Why do you think that stood out to him? A: I’ve heard this story from lots of big companies. They get this stack of résumés that is pretty high, and there are a lot of kids that look similar. Once a résumé passes through the initial filters of “they have a good GPA, they have the minimum number of personal projects,” or whatever, then they ask themselves “OK, now what’s left?” Well, what’s left is the stuff that makes them all different. The thing that made me stand out was something that just randomly happened. I had an amazing professor, Joe Fornieri, who I took Political Rhetoric and Deliberation with. He liked the stuff that I wrote and he invited me to go speak publicly. I did that and it was awesome! I spoke at Colgate University about Plato’s Gorgias. Different skills bring something new to the table, and when I told my interviewers about the experience, they were impressed. They wanted people who were good at communicating, and that skill made me stand out. Q: What about Plato interests you? A: Plato thinks like an engineer! One of the things we learned about in Political Rhetoric and Deliberation was that all of Plato’s pupils who studied with him had to learn what was called “logic,” which was what they had of math. You actually had to know all of the math that the Greeks knew at the time in order to even start philosophy. Back then, the theory of knowledge was that first you need to be good at pure logic, then you had to be good at science, and then you had to be good at other things. At the height of all knowledge, once you mastered everything else, was philosophy. I like how Plato preaches the importance of logic. In Gorgias, Plato is yelling at Gorgias for using rhetorical tactics and lying to try to manipulate the entire country; and Gorgias was! As an engineer, a guy pointing at someone else who doesn’t use logic and says, “You’re wrong, what are you doing? Why do people listen to you,” stands out to me. Q: Was it intimidating speaking at Colgate University on a liberal arts topic when you are an engineering major? A: At first I was kind of like, “I don’t belong here, why am I here?” I was definitely freaked out, but Dr. Fornieri was really chill about it and just told me to go up there and say my stuff, so I did it. I don’t know what it was like being on the receiving end of my speech, but people afterward seemed really interested in me. Honestly, I don’t really remember it. I was that afraid of giving my speech. I read it off the paper, I made eye contact, and externally I probably looked fine, but I was very scared. I was also afraid because this was a conference that had been happening for years. Half of the audience was professors that had written books on Plato, and the other half was other students that were full-time liberal arts. Q: How do you feel your knowledge of Plato and public speaking gained through that experience has helped your abilities as an engineer? A: Plato is a master at teaching people how to take their idea and make it small and simple. Engineering has a lot of room to grow in boiling things down to the simplest way we can say things. Someone once said, “Everything should be made as simple as it can, and no simpler.” I don’t remember who said it, but they meant that you should simplify things as much as possible. You want to trim away all the extra words, but not so much that you are losing important details. I think young engineers in school would have a lot to learn from that and Plato’s concept of boiling things down. A: It depends on how my next co-op goes, whether or not I like cybersecurity. I still have to do one more co-op, and I’ve been considering going back and doing something in the space industry. I’ve made a couple friends and have some recommendations from SpaceX, so I might go there because they are pretty awesome. I love California, so I might go somewhere in that direction, but I’m not sure. I have a lot of things I could do, but I haven’t decided yet.